Whether you’re managing a small- or medium-sized business or running an enterprise-level organization with hundreds of business locations, you can’t deny the importance of your local search ranking on Google. Profile photos (24 percent), Google Reviews (21 percent), and SERP position (21 percent) were the three things most likely to be considered “most important” by local searchers. In short: higher local search rankings = more store visits and sales = increased traffic and revenue. Local search on Google can come in different shapes and sizes, and results are displayed in various ways across Google Maps and Google Search. For example: if you search for “coffee shop” using your mobile device or laptop, local results appear, offering a list of nearby businesses relevant to the search query. These results may point to the Google listings of the nearby businesses, or they may lead to third-party listings and profiles, such as a business’ Yelp or Facebook Page or TripAdvisor profile. 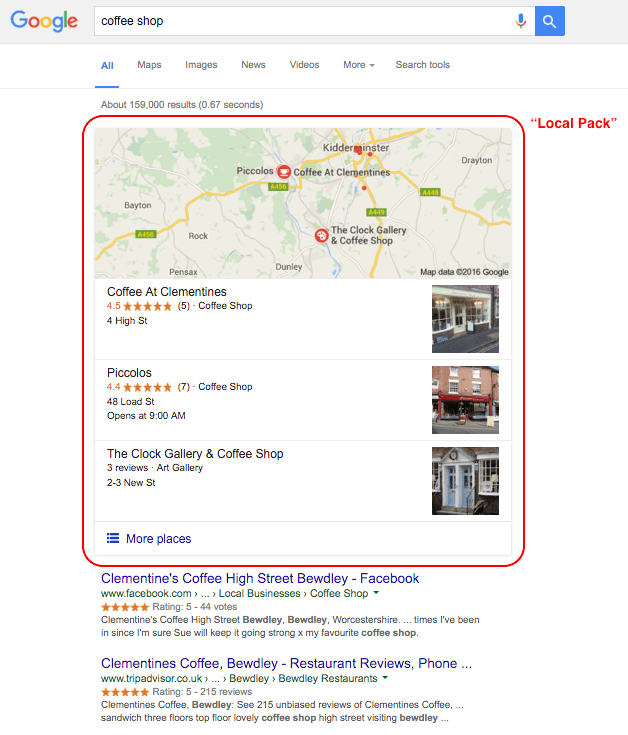 The “local pack”: One of the most prominent and therefore sought-after places in Google’s local search results is the “local pack”: a set of three highlighted Maps-based results (it used to have seven results) featuring the most highly ranked businesses based on the factors that determine local ranking. Relevance: This refers to how well your business listing or the content of your website matches what a user is searching for. Having complete, detailed, and up-to-date business information improves your relevance and helps match your listing to relevant local searches. Distance: This refers to the distance between your business listing’s indicated location and/or service area on Google and the location term used in a Google search query. The location term is simply the user’s location, determined based on location information about the device they used for searching. Prominence: This refers to the offline and online prominence of your business. “Some places are more prominent in the offline world,” reads the Google help article, “For example, famous museums, landmark hotels, or well-known store brands.” Online prominence, meanwhile, is based on the kind of information available on the Web about your business. This includes the quantity and quality of your online reviews, as well as online scores and ratings. One of the most effective and fundamental ways to improve your local search ranking is by claiming your business listing and managing your information using Google My Business. Be as detailed as possible when entering your business information; include your business name, category, map location and service area, phone number, website URL, hours of operation, etc. It also helps to add high-quality photos, which enhance the visual appeal of your business listing and may appear in local search results, too. At all times, make sure your information on Google My Business is correct, complete, and up-to-date. We can’t stress this enough. Check out the ReviewTrackers guide on how to claim your business listing on Google. A well-managed listing on Google My Business fosters significant improvements in local search performance, with particular emphasis on the “relevance” factor of local search. Get verified: To access all the features of Google My Business, you will need to verify that you are the owner or manager of the business you enlisted. Postcard: You request a postcard with a verification code to be mailed to your business address, and you enter the code on Google My Business to complete verification. Phone: You receive a code sent to your phone via an automated message or phone call, and you enter the code on Google My Business to complete verification. Instant verification: You may be instantly verified if you have already verified your business website with Google Search Console. Managing 10 or more locations? Read more about the Google My Business bulk verification process. When creating or claiming your business listing on Google as well as on other online review websites, local search services, and data aggregators (think Yelp, Facebook, Citysearch, etc. ), ensure that you provide consistent local business data across the Web. Consistency in entering your NAP (name, address, phone number) information is particularly important, since this relates to all three primary factors that affect your local ranking on Google. In the US, 37 percent of businesses have at least one incorrect or missing name on their listings. 43 percent have at least one incorrect or missing address. And 18 percent are missing their phone numbers. The estimated cost of wrong local data is $10.3 billion in potential annual sales. Along with third-party researchers and industry professionals, Google has made it clear that online reviews have a major impact on your local rankings — it’s even started to reward users who leave the most (and best reviews) with the title of Google Local Guide. More (and better) reviews and ratings of your business on Google as well as on other third-party review sites can lead to greater online “prominence” — one of the three primary factors influencing Google local search. Managing and responding to reviews also drives engagement with your existing and potential customers. It shows that your business values customer feedback, helping boost shopper confidence and foster consumer trust. Sign into your Google My Business account. Click “Manage location” to select the business location that received the review to which you would like to respond. Look for the “Reviews” option and click “Inbox”. Keep in mind that you can only respond to reviews on Google once your business listing has been verified using Google My Business. All responses to reviews are public. If you’re already delivering experiences that customers love, they won’t hesitate to vouch for you. All you have to do is ask. According to research, businesses that proactively request for reviews enjoy higher ratings (average of 4.34 stars) than those that simply wait for unprompted reviews (3.89 stars). Apart from the impact that they have on search engine performance, great reviews from your happiest customers also help create powerful social proof for boosting business reputation, inspiring consumer confidence, converting organic local search traffic, and driving sales. What’s measured gets managed. That’s why it’s important to keep an eye on your location data: how much traffic you’re generating, how many people route visits to your locations, what type of information they’re looking for. By monitoring your location data, you’ll be able to make data-driven decisions that positively impact your Google local search ranking. Chances are that you have already applied basic optimization techniques on your website, with the goal of improving your visibility in organic search. Improving your ranking in local search on Google is another story. There is a wide range of ranking factors and signals that you have to take into account, and many of these will affect how you should structure and expand your website. One local SEO feature that many marketers have incorporated into their website is location pages. Location pages can be described as silos or micro-sites containing optimized content for each of your locations, yet are all linked to your main website. Apart from adding the business name, physical address, and phone number to each of your location pages, you can also provide unique store descriptions, operating hours, an “About Us” section, news, deals, and promotions, information about the team or staff, customer reviews and testimonials specific to the location, case studies, and other types of information that you think will be relevant to your page visitors. And don’t make these locations available only through, say, a site search feature or your location finder. Ensure that Google and other search engines can discover and index your location pages. Great article, and very practical. Local SEO is a major key to increasing web traffic (and hence foot traffic) and there are still a lot of people who could be doing it better. It is so important that your customers be able to easily find you on google. These are some great tips that helped me better understand how my business could be found easier on local searches. I think the most interesting thing to learn is how closely related search traffic is to foot traffic. If someone sees my business in a search they are very likely to come in person.